All too often, parents rush to get their child out of a crib or into a bed, as though it were a sign of achievement, maturity, or their guaranteed success as adults, some act like it’s the ultimate toddler sleep solution. One woman I worked with even reported an unspoken competition in her playgroup to see which baby could make the crib to bed transition first! Children who switch too young to a bed may experience sleep disruptions, and difficult bedtimes with tears and tantrums. Safety is also a factor. I worry a lot about a 20-month-old roaming around in his room at night, pulling out drawers, unplugging lamps, exercising all that wonderful but potentially hazardous curiosity. Even if the child is trying to climb out of the crib, I almost always advise parents to keep him in his crib as long as possible, definitely until two and a half, and preferably until three. By then, a child has the cognitive and verbal skills to understand the “big bed” rules. Children who move from the crib too early don’t necessarily understand that they need to stay in their bed all night long. Then they keep getting out of their bed over and over again, and you may end up having to gate the doorway, which sometimes provokes the tears and tantrums that you were trying to avoid. They may also miss that feeling of cozy containment in their crib. I know some families who regretted moving the child to the bed and managed to get him back to a crib, particularly if he was talking about his crib or trying to climb into a younger sibling’s crib. That’s not regression. It is listening to your child. Don’t rush your child out of a crib for a new sibling if they are under 2.5 years old when the baby arrives. It is better to borrow or a buy a good used crib for the new baby. You don’t want a toddler or preschooler getting out of a bed to check on the baby with you multiple times in a night! As you can tell, I like keeping toddlers in the crib as long as I can but they sometimes have their own agenda. If your child starts climbing out, dissuade him by making the climb harder by lowering the mattress. Put pillows on the ground for safety in case he attempts Olympic-style hurdling. Remove large toys and stuffed animals from the crib that might serve as a launch pad. If he does get out, put him right back in the crib with minimal interaction – except to say, “No climbing.” Be firm, but don’t yell at him. Try stationing yourself outside the bedroom door, out of his line of vision if possible, and peek in. When he starts to raise his leg again say, “No climbing.” Sound like you mean it, and keep putting him back in the crib if you have to. You may also try to put him in a long T-shirt or nightshirt, which makes it harder for him to climb. If your child still seems determined to get out, particularly if he’s under the age of two, try using a crib tent, a zipped mesh cover that lets him see out but not get out. That may buy you a few months before you switch to the bed, although if your child hates the tent, and some do, don’t push it. Some kids start talking about “big boy” or “big girl” beds, perhaps after seeing cousins or friends sleeping in big beds. If they can articulate it, that’s a reasonably good sign that they have the verbal ability to understand big-bed rules. Have your child help you pick out special sheets for his new bed and make a big deal out of it. Get him involved- have him help “assemble” the bed, put on the new sheets, pick which stuff animals will sleep with him etc. If you need to take the crib out of his room to fit the new bed in then put the bed in the same place as the crib or on the same wall as the crib was on. If you are moving your child to a new room then I would suggest you decorate it, spend time in his room with him and talk about the change a couple of weeks before you actually change rooms. You may even suggest he nap in there on occasion. Try to put the bed in the same relative place to the door as was in his old room if possible. Many children like their beds in corners with a rail on the other side. Once all his things are moved in to his new room, you can pick the first night that he will sleep in his new room and then don’t turn back! If you need to do a modified Shuffle to help your child adjust to their new room then go ahead. Same for if you are moving to a new house. Change can be disruptive to anyone, no matter how old we are! Make sure the room is safety proof since now your child can get out of their bed unsupervised! Use a bed rail so he won’t fall out. Remind him that with this privilege come rules – like staying in bed all night. Sticker charts are wonderful behavior incentives for older children. Children who don’t yet understand a chart may like wearing a sticker in the morning. On his first night in the big bed, explain how important it is to stay in his bed all night long until morning time. Remind him that you will check on him before you go to bed. For the first few nights stay near his bedroom at bedtime, perhaps putting away laundry in your room, and reassure him from your room if he calls out to you. If he comes out of his room, quickly and quietly return him to his room, tuck him in and remind him that you expect him to stay in his bed all night long. This article is geared toward children who already know how to put themselves to sleep (sans sleep crutches) and are ready to transition to a bed. 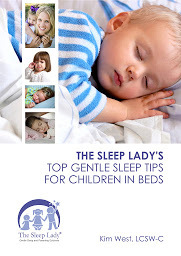 If you are attempting to sleep coach a child who is newly in a big bed then I would suggest you do the “Shuffle” as outlined in the age appropriate chapter in “Good Night Sleep Tight”. As always, though, remember that each child is an individual and it is important to listen to the cues they are giving you. What may have worked for one child does not necessarily work for their siblings. Clear rules and parental consistency are essential for transitioning from the crib to a bed, mixed liberally with plenty of love, cuddles, and kisses!